Keep yourself covered for this Liturgical year with this book of Lectionary readings and bible passages, all in a pocket size. This essential handbook presents the authorised Bible readings (references only) for the liturgical year beginning Advent Sunday 2016. It includes: - a full calendar of the Christian year - complete lectionary references to the Principal, Second and Third services for Sundays and Principal Feasts and Holy Days - lectionary references for Morning and Evening Prayer on weekdays - the Additional Weekday Lectionary - general readings for saints days and special occasions - a guide to the liturgical colours of the day. A must-have reference guide for every vestry and parish office. This is the standard pocket-book size edition. 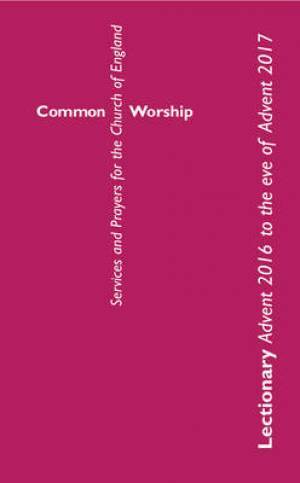 Common Worship Lectionary Advent 2016 to the Eve of Advent 2017 was published by Church House Publishing in April 2016 and is our 13315th best seller. The ISBN for Common Worship Lectionary Advent 2016 to the Eve of Advent 2017 is 9780715123188. Be the first to review Common Worship Lectionary Advent 2016 to the Eve of Advent 2017! Got a question? No problem! Just click here to ask us about Common Worship Lectionary Advent 2016 to the Eve of Advent 2017.